So, everyone of you might be eagerly waiting for this and finally it is here. If Snapdeal and Flipkart have announced the festive season sale, how can the e-commerce giant Amazon be left behind. 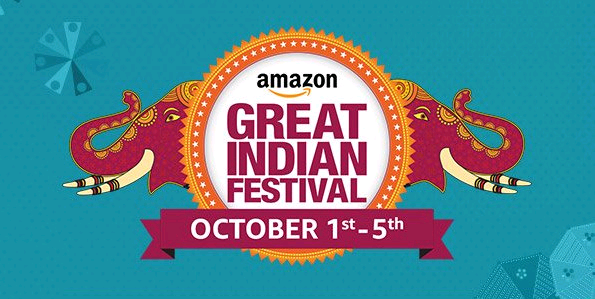 Amazingly, Amazon has announced its Great Indian Festival for the upcoming festival season from October 1st to 5th. The theme for the Amazon's Great Indian Festival is themed 'Tyohar Bade Dilwala' and will begin a day before the Flipkart and Snapdeal get into the field. The Great Indian Festival is loaded with popular deals and offers on smartphones, laptops, tablets, books, PCs, toys, musical instruments, clothing, stationery products, baby products, shoes, beauty products, pet products, gardening accessories, gourmet foods, and more. The delivery options include same day delivery, one-day, two-day, and even on Sunday or morning which is available in several cities. Also, the prime members would be able to access the Top Deal 30 minutes early. Amit Agarwal, VP and Country Head, Amazon India said, "This year we recognize and celebrate the big heartedness that underlies festivities and have themed the Great Indian Festival as Tyohar Bade Dilwala. We are delighted to celebrate this with our customers as much as with the entire ecosystem of our sellers, vendors and partners to bring festive cheer all over the country. These marathon 120 hours of the event mark our continuing commitment to work closely with our partners and together bring the biggest sale yet for our customers, with the best ever shopping experience powered by Prime".